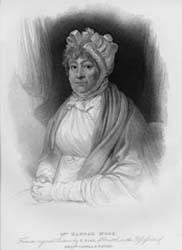 Although not strictly a resident, Hannah More spent much time at Hampton from 1776 with the Garricks and, after David Garrick's death in 1779, she spent "twenty winters" with his widow Eva. Hannah More wrote poetry and plays and, later, religious tracts. She was born at Stapleton, near Bristol, the fourth of five daughters, where her father was a schoolmaster. Educated at a boarding school in Bristol run by her sisters, she took a share in the enterprise. After a long and ultimately unsuccessful courtship with an older man, she came to London in 1774. She became a close friend of the Garricks and, in 1781, a friend of Walpole. She also became friendly with Dr Johnson and together they formed a small mutual admiration society. Her tragedy Percy was produced by Garrick in 1777. After Garrick's death in 1779 she began to think that playgoing was wrong. So when Percy was revived, in 1787 with Mrs Siddons as the heroine, she declined to attend. Turning to religion she became a well known religious writer and her work led to the founding of the Religious Tracts Society. 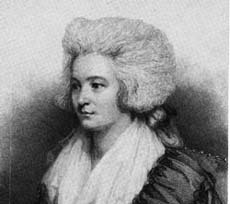 She was a leading member of the Clapham Sect and so became a friend of William Wilberforce, She spent much of the later part of her life in and around Bristol furthering educational and religious causes. She built herself a house at Barley Wood, near Wrington. Where she was joined by her sisters and frequently visited by and corresponded with Wilberforce. In an undated letter perhaps from 1827 she noted that “I have a letter from Mr Wilberforce to get petitions for evangelizing India - I will send it to Mr J Vaughan.” The Revd James Vaughan was the incumbent at Wraxall, near Bristol. The efficient government of India was one of the preoccupations of the Clapham Sect: a member, Lord Teignmouth had been Governor-General. In 1828 she moved into Clifton, Bristol and died there in 1833, leaving about £30,000 to charitable institutions and religious societies.